قاهری, علی, نثیر, اصغر. (1393). بررسی ارتعاشات اجباری غیرخطی نامتقارن ورق‌های نازک دایروی از جنس مواد هدفمند. 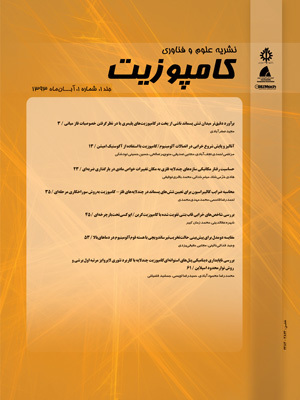 علوم و فناوری کامپوزیت, 1(2), 1-10. علی قاهری; اصغر نثیر. "بررسی ارتعاشات اجباری غیرخطی نامتقارن ورق‌های نازک دایروی از جنس مواد هدفمند". علوم و فناوری کامپوزیت, 1, 2, 1393, 1-10. قاهری, علی, نثیر, اصغر. (1393). 'بررسی ارتعاشات اجباری غیرخطی نامتقارن ورق‌های نازک دایروی از جنس مواد هدفمند', علوم و فناوری کامپوزیت, 1(2), pp. 1-10. قاهری, علی, نثیر, اصغر. بررسی ارتعاشات اجباری غیرخطی نامتقارن ورق‌های نازک دایروی از جنس مواد هدفمند. علوم و فناوری کامپوزیت, 1393; 1(2): 1-10. در تحقیق حاضر ارتعاشات غیرخطی اجباری ورق‌های نازک دایروی از جنس مواد هدفمند با در نظرگرفتن شرایط مرزی کلاسیک گیردار مورد مطالعه قرارگرفته است. برای واردکردن جملات غیرخطی هندسی ناشی از جابجایی‌های بزرگ ورق در راستای عرضی (به اندازه ضخامت ورق) از روابط کرنش - جابجایی ون‌کارمن، و برای حل معادلات دینامیکی حاکم بر سیستم از روش اغتشاشاتMMS و مدهای فرضی در دستگاه مختصات قطبی استفاده شده است. خواص مکانیکی در راستای ضخامت ورق بر طبق رابطه توانی از کسر حجمی مواد تشکیل دهنده ماده هدفمند تبعیت می‌کند. نیروی عرضی اعمالی به صورت هارمونیک، به فرکانس نوسان نزدیک به یکی از فرکانس‌های طبیعی نامتقارن سیستم فرض گردیده است. پدیده‌های ارتعاشات غیرخطی مانند پرش و رزونانس داخلی مورد بررسی قرارگرفته و اثرات شرایط مرزی، تغییرات کسرحجمی ماده هدفمند، دامنه و فرکانس نیروی خارجی اعمالی بر رفتار دینامیکی مطالعه شده است. نتایج بدست ‌آمده از این روش با نتایج موجود در کارهای گذشته و در صورت امکان با نتایج نرم‌افزار‌های المان محدود صحت سنجی شده‌اند. Abstract Nonlinear forced vibrations of thin functionally graded circular plates under classical clamped boundary conditions are investigated based on the classical plate theory. The von Karman strain-displacement relations are employed to include the geometrical nonlinearity caused by large transverse displacements of the order of the plate thickness. Modal expansion in polar coordinate system along with the perturbation method of multiple scales is used to solve the governing equations. The material properties are graded through the plate thickness according to a power-law distribution of the volume fraction of the constituents. Transverse forcing is supposed to be harmonic with the angular frequency near to the natural frequency of one particular asymmetric mode. Nonlinear vibration phenomena such as jump phenomenon and internal resonance are studied and the effects of boundary conditions, power-law distribution, amplitude and frequency of external load on dynamical behavior of circular plate are examined. The validity of results is established by comparison with the existing results in the literature as well as FEM results. Nayfeh, A.H. and Mook, D.T., “Nonlinear Oscillations,” New York, John Wiley and Sons, 1979. Chia, C.Y., “Nonlinear Analysis of Plates,” Mc Graw Hill, New York, 1980. Koizumi, M., “The Concept of FGM,” Ceramic Transactions, Functionally Gradient Materials, Vol. 34, pp. 3-10, 1993. Miyamoto, Y., “Functionally Graded Materials: Design, Processing, and Applications,” Dordrecht, Netherlands, Kluwer Academic Publications, 1999. Leissa, A.W., “Vibration of Plates,” NASA SP-160, U.S. Government Printing Ofﬁce, Washington DC, USA, 1969. Tobias, S.A., “Free Undamped Non-Linear Vibrations of Imperfect Circular Disks,” Proceedings of the Institution of Mechanical Engineers, Vol. 171, No. 1, pp. 691-715, 1957. Williams, C.J.H. and Tobias, S.A., “Forced Undamped Non-Linear Vibrations of Imperfect Circular Discs,” Journal of Mechanical Engineering Science, Vol. 5, No. 4, pp. 325-335, 1963. Touze, C., Thomas, O. and Chaigne, A., “Asymmetric Non-Linear Forced Vibrations of Free-Edge Circular Plates. Part I: Theory,” Journal of Sound and Vibration, Vol. 258, No. 4, pp. 649-676, 2002. Thomas, O., Touze, C. and Chaigne, A., “Asymmetric Non-Linear Forced Vibrations of Free-Edge Circular Plates. Part II: Experiments,” Journal of Sound and Vibration, Vol. 265, No. 5, pp. 1075-1101, 2003. Lee, W.K. and Yeo, M.H., “Non-Linear Interactions in Asymmetric Vibrations of a Circular Plate,” Journal of Sound and Vibration, Vol. 263, No. 5, pp. 1017-1030, 2003. Gunes R. and Reddy J.N., “Nonlinear Analysis of Functionally Graded Circular Plates Under Different Loads and Boundary Conditions,” International Journal of Structural Stability and Dynamics, Vol. 8, No. 1, pp. 131-59, 2008. Fallah, F. and Nosier, A., “Nonlinear Behavior of Functionally Graded Circular Plates with Various Boundary Supports Under Asymmetric Thermo-Mechanical Loading,” Composite Structures, Vol. 94, No. 9, pp. 2834-2850, 2012. Allahverdizadeh, A., Naei, M.H. and Rastgo, A., “The Effects of Large Vibration Amplitudes on the Stresses of Thin Circular Functionally Graded Plates,” International Journal of Mechanics and Materials in Design, Vol. 3, No. 2, pp. 161-174, 2006. Hu, Y. and Zhang, Z., “The Bifurcation Analysis on the Circular Functionally Graded Plate with Combination Resonances,” Nonlinear Dynamics, Vol. 67, No. 3, pp. 1779-1790, 2012. Amini, M.H., Soleimani, M., Altafi, A. and Rastgoo, A., “Effects of Geometric Nonlinearity on Free and Forced Vibration Analysis of Moderately Thick Annular Functionally Graded Plate,” Mechanics of Advanced Materials and Structures, Vol. 20, No. 9, pp. 709-720, 2013. Fung, Y.C. and Tong, P., “Classical and Computational Solid Mechanics,” World Scientific, New Jersey, 2001. Nayfeh, A.H. and Pai, P.F., “Linear and Nonlinear Structural Mechanics,” John Wiley and Sons Ltd, United Kingdom, 2004. Sridhar, S., Mook, D.T. and Nayfeh, A.H., “Nonlinear Resonances in the Forced Responses of Plates. Part II: Asymmetric Responses of Circular Plates,” Journal of Sound and Vibration, Vol. 59, No. 22, pp. 159-170, 1978. Rao, S.S., “Vibration of Continuous Systems,” John Wiley and Sons, Hoboken, 2007.